We are proud to announce another amazing giveaway. 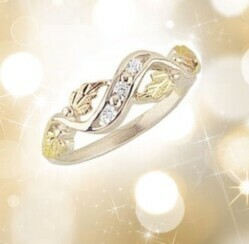 A lucky winner can receive this gorgeous gold and silver ring by jewelryblackhillsgold.com. See the contest instructions below. This Black Hills Gold Silver Lady’s Three Stone CZ Ring comes in Black Hills Gold jewelry style of 12 k pink-gold and 12 k green-gold leaves on Sterling Silver. This Black Hills Gold Silver ring has three round brilliant cut 2.0 mm CZ stones in channel setting across the top. Small Black Hills Gold Silver Ring has a figure 8 design of three CZ across top. Black Hills Gold Becomes prettier and brighter the more it is worn. Clean with a soft brush and mild soap. 1. Go to ChristmasGifts.com and choose a product you love. Click on that product. 2. Scroll down to the “share this” section under the product and share the product on your favorite social media account, i.e. Facebook, Twitter. 3. Then copy and paste the link of the product on our Facebook contest post. That it! Maximum 5 entries per Person. This gold and silver ring is beyond stunning, what woman who loves fine jewelry wouldn’t absolutely love wearing this gorgeous ring, I know I absolutely would love this. My favorite Christmas Gifts product is the 60″ Christmas Angel with Dove. I love Black Hill Gold. I shared on facebook. Would love to get a locket, mine is 20 plus yrs old.